The entrepreneurial spirit he inherited from his parents and grandparents led Tayde Aburto to found the Hispanic Center of e-Commerce eight years ago. Today, it boasts more than a thousand members. Tayde Aburto was born and raised in the city Morelia, Michoacán, where he got an early start in business by helping out at his parents’ restaurant or the family’s movie theater. These were just a couple of the plethora of jobs that stirred his business curiosity. Having obtained a degree in Economics and a Masters in Marketing at Mexico’s Tecnológico de Monterrey, he arrived in San Diego in 2006, where he got a job as a market analyst for Kyocera Wireless Corporation. Two years later, after getting to know the local market, he realized that there was a digital gap between the Hispanic community and the business world. Thus was born the idea of founding a Chamber of Commerce to help Hispanic small businesses. “At the end of the day, what we want is for these businesses to be able to grow through these tools and for them to increase their market presence,” said Aburto. 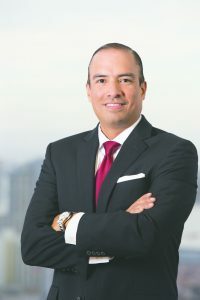 At first, it was difficult to convince businesspeople to adapt to this type of commerce that is done through a computer or smartphone, but Aburto says that in recent years there has been a growing interest in e-commerce by Hispanic businesses. The Hispanic Chamber of e-Commerce now also offers courses throughout the County to educate small business owners as to the need to have, at the very least, a website, Facebook page, or LinkedIn account. “I tell them, just like you look for other companies, other companies or potential customers are out there looking for you,” said Aburto in regards to the importance of building a brand and credibility with their customers. The main obstacle, he says, is to get rid of the idea that using these tools “is complicated,” and get them to see that all they need to do is invest a few minutes every day in increasing their online presence, and that can lead to additional sales. The Hispanic Chamber of e-Commerce lives its credo, as it has built networks with the business world using online presence and social media, which is how they have grown to 1,057 members. The Hispanic Chamber of e-Commerce invites micro-business owners to attend the workshop and business meeting entitled “Facebook Marketing Strategies for Businesses” to be held on April 14th, 2016, at the Yoga and Art Meditation Center located at 2508 Catamaran Way, Chula Vista 91914, from 6:00 – 8:00 p.m.
To register or for more information, please visit their website: http://www.hiseb.com.